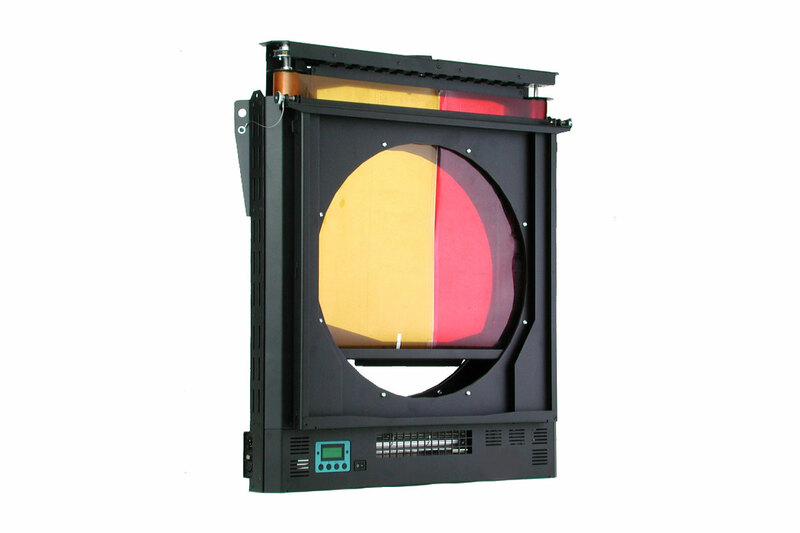 The color changer MagMax is a versatile, easy to use cartridge color changer. Because of the cartridge system it possible to change quick and easy the color string. The frame positions are autimatically scanned after inserting the cartridge. This is realized by aluminium markers, which are moving through a light sensor. With this technique frame positions can be corrected during operation, when the string is expanding because of the heat. The programming possibilities are indicated in plain text on the LCD display. Further features are a dark color mode and a real time drive for fade overs. High resoluion sensors provide exact, synchronous moves like horizontal fades with a couple of devices. 1, 2 or 3 DMX-channels are used (depends on operating mode). Further information in the manual and product information.